Glorious victory, a prophecy and a promise led by Sharks 1st Xl skipper. 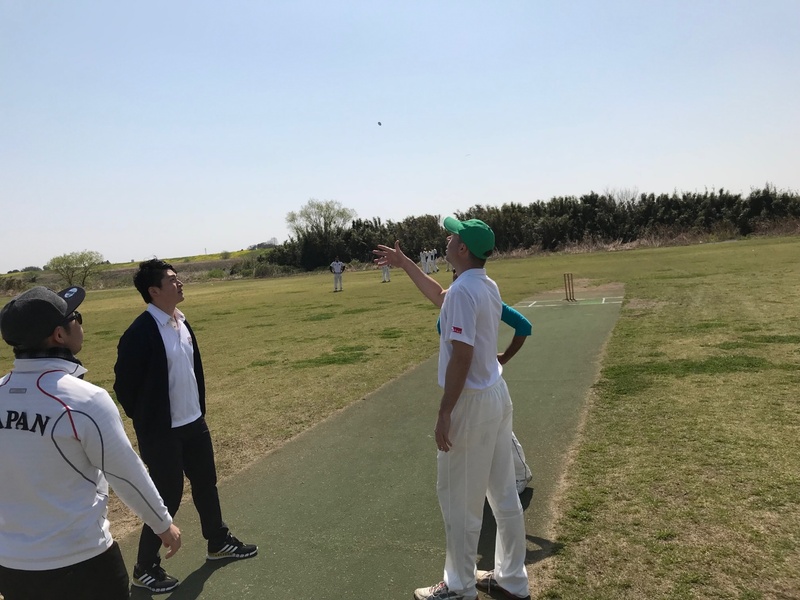 Not too cold and not too hot at Sano 3, it was perfect for cricket. Once again, but freshly primed for 2018, the Sharks 1st X1 were led out by captain Dhugal. With team sheets confirmed for the starting match against Paddy Foleys, a formidable line-up was confirmed: Dhugal (Cpt. ), Takady (V.C. 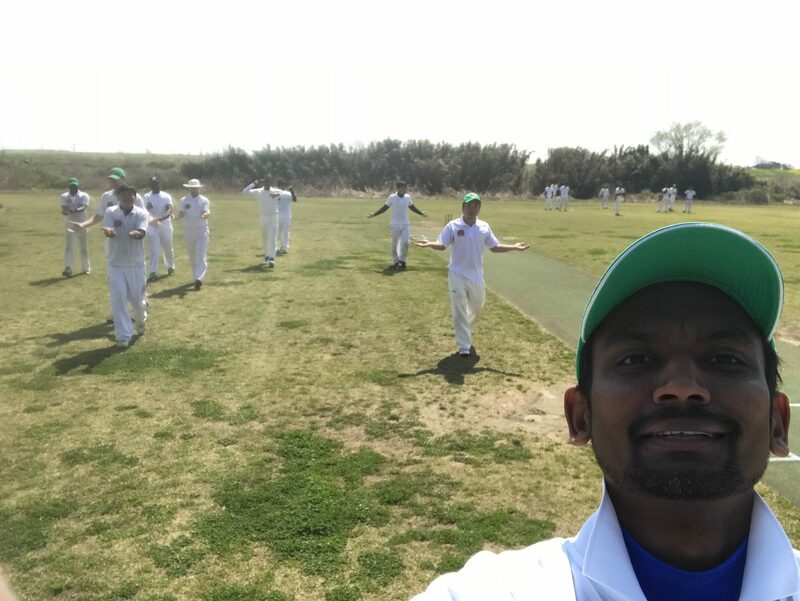 ), Sanjay (new player), Shiham (new player), Pave (MO), Arata (new player), Asala (WK), Rui, Vivek, Tommy, Awal, KB (also here as Aide-de-Camp). All the Sharks were waiting for this moment to get out and play cricket, and you could feel the energy from the great looking (questionable), young and old players who are keeping their eyes on the prize. Paddy Foley won the toss and decided to field. I believe it didn’t matter to our skipper, because the Sharks just love to bat first. 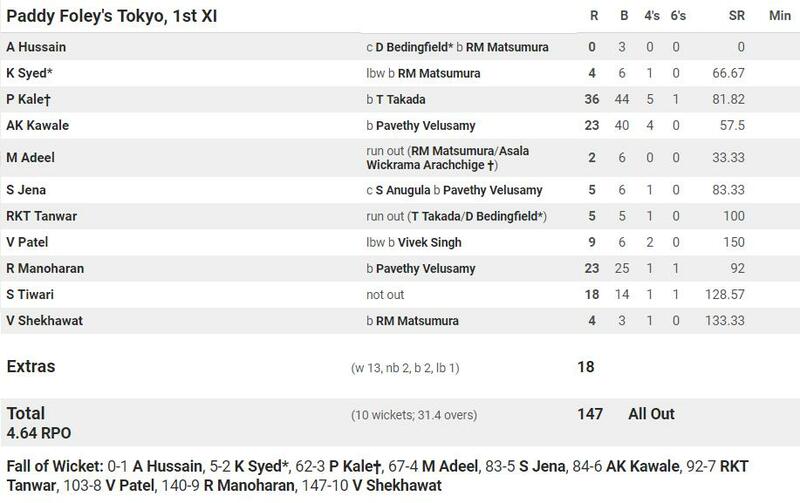 Having said that, Dhugal and Sanjaya opened the innings. Both of them had a cracking opening; the first over going for 10 runs with 2 classy boundaries. . . and it did not stop there. When the first 5 overs had ended, Sharks were 48 runs with numerous boundaries chalked up. 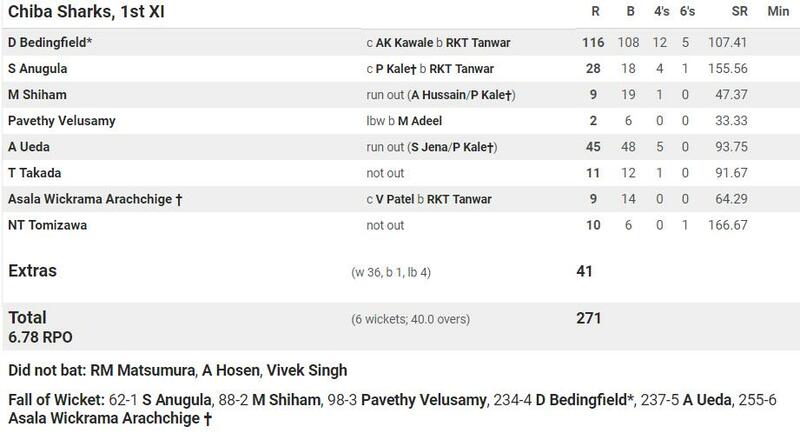 Dhugal’s instruction was for the openers to hold the line till first 10 overs were done, but unfortunately Sanjaya was caught and ended his inning on 8th over; a great contribution to Sharks though. The Scoreboard was quite literally shining with runs; 1 wicket 8 overs and 62runs. The pace and flow continued with fantastic numbers, with Shiham joining Dhugal to carry on the duty. Shiham showed great batting skills until his demise in the 14th over; but the Sharks were only 2 wickets down for a glittering 88 runs. Dhugal was in his stride and pushing forward to keep his prophecy and promise to KB. Off the record and behind the scenes, Asala and KB were updating the Sharks Facebook page. All the other Sharks who were waiting anxiously at home or wherever they may be, would be kept up-to-date on the minute by minute play at Sano 3 . . . Soon Pav joined Dhugal. While Dhugal was on fire with absolutely great sixes and boundaries, Pav was ready to put his game on. But he missed his timing and got trapped for a full toss that resulted in an LBW on the 17th over. Arata joined Dhugal and they had a great partnership. Arata made 45 runs aggressively and Dhugal fulfilled his promise to KB by scoring 100 runs, pouring down sixes, majestic boundaries, all with a great deal of flair – international call-up was back on the cards. Great batting, skipper! Dhugal went for another six and a boundary, but this time it ended his inning with a huge edge that skied high toward third man and was unexpectedly caught by the Paddy Foley outfield (instead of their usual soccer feet approach). Takady, Asala, and Tommy contributed with their bat in the last 5 overs, with the Sharks batting through the full 40 overs and ending with 271/6. Rui started the Foleys innings with the ball. The First ball came to Asala’s glove behind the wicket and it was high over the stumps. Dhugal licked his lips at first slip, and Sanjaya did a little dance at second slip . . .they were waiting for that tickle. Asala, the wise old Asala that he is, suggested to move back a little for the second ball which came down with beautiful outswing, touching the edge of the bat and travelling straight to Dhugal’s hands perfectly to hold on to it. Great work by Rui and Dhugal (and not bad by Asala either). Vivek started from the other end. The Sharks fielding was very tight and everyone was at their best. All kinds of action happened throughout the overs that followed with plenty of Foley’s men bowled out, going down to LBW, caught, or having their stumps strewn around the ground from classy run outs. Paddy Foleys were struggling as they made 100 on 22nd over with 7 wickets down. Before you knew it in fact, Paddy Foleys were 141 and all out by the 30th over. Great start to the season, fabulous leadership, great energy among the sharks, and a great day for cricket with some of the best conditions available to us. More importantly, a fantastic win and brilliant teamwork on display by this Sharks 1st Xl. 2018 will be something to watch with great anticipation . . .